MINNEAPOLIS, Minn NOVEMBER 30, 2016 /PRWeb/ Abigail Harrison, also known as Astronaut Abby, American STEM education and space exploration advocate, will meet with leaders of the United Arab Emirates Space Agency and tour the Mohammed bin Rashid Space Centre (MBRSC). Harrison is there specifically to view and experience the Hope Mars Probe program due to launch in 2020. Touting a social media audience of over 600,000 fans and followers, Harrison is a recognized as a leader in her generation, the Mars generation – identified as the generation expected to first step foot on Mars in 2030. Tour the Emirates Mars Mission – the Hope Probe currently in the manufacture stages at the Mohammed bin Rashid Space Centre (MBRSC. 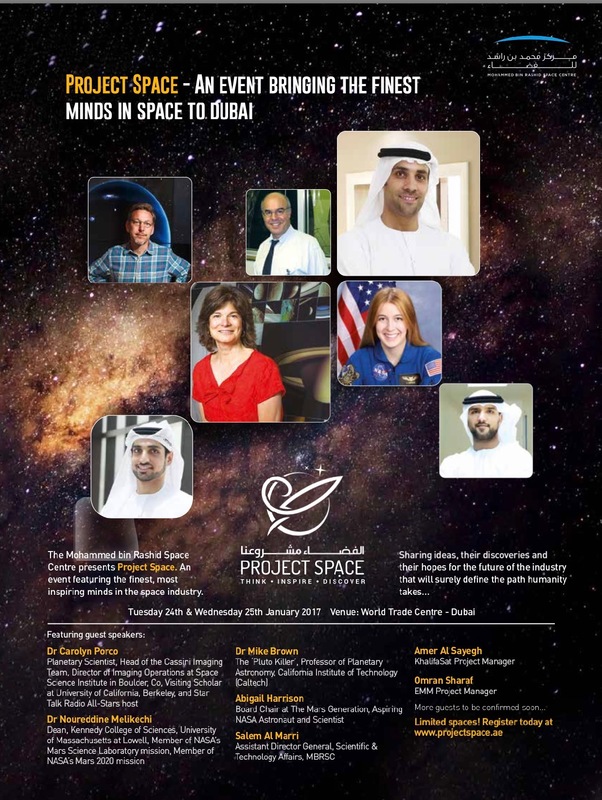 Meet with leaders of the UAE Space Agency and tour the Mohammed bin Rashid Space Centre. Tour several UAE universities and meet with students and faculty collaborating with the UAE Space program. Speak at Project Space January 24-25, 2017. This prominent space industry event brings the finest minds in the space sector to Dubai to share knowledge, ideas, their discoveries, and their hopes for an industry that will define the future of humanity. Renowned planetary scientist and leader of the NASA Cassini imaging science team, Dr. Carolyn Porco and Caltech Professor of Planetary Astronomy, Dr. Michael Brown and many other notable speakers, will join Harrison. Tour Dubai and see local history and attractions to gain an understanding of the culture and people. To tune into Harrison’s unprecedented UAE tour January 14 – January 26, 2017 follow the hashtag #TMGtoursUAE on Twitter and check out all her social media channels listed on her blog at AstronautAbby.com. Harrison is the founder of The Mars Generation nonprofit. Currently a sophomore at Wellesley College in Massachusetts majoring in Astrobiology and Russian, Harrison is positioned to enter a PhD program upon graduation and continue her pursuit of becoming a scientist, astronaut and member of the first human crew to land on Mars in the 2030’s. Supporters around the world follow her journey to becoming an astronaut via the blog Harrison authors at AstronautAbby.org. The Mars Generation is a 501(c)(3) nonprofit in the United States. The organization is volunteer-driven with a board of directors that includes astronauts, engineers, scientists and professionals from the nonprofit and business communities. With a reach of more than 10 million people in the organization’s first year of operation and more than 600 students from around the world participating in its Student Space Ambassador program, over 600 donors, 350 members and several space industry sponsors in place, the organization continues to grow and offer programs to excite and educate students and adults about the importance of human space exploration and STEM education. The Mohammed bin Rashid Space Centre (MBRSC) was created and established by the Dubai Government in 2015. The Centre is integral to the strategic initiative put in place by the government to inspire scientific innovation, technological advancement, and to advance sustainable development in Dubai and the wider UAE. The Centre is comprised of a team of leading UAE engineers, analysts and experts all working towards positioning the UAE as an internationally renowned leader within the field of science and technology. By developing new technology, expertise, and intellectual property, it is hoped that the UAE can emerge as a global front-runner within the industry. As part of the United Arab Emirates’ commitment to their space program, the Arab nation plans to send a probe to Mars in 2020. The Emirates Mars Mission – Hope Probe is currently in the manufacture stages at the Mohammed bin Rashid Space Centre (MBRSC). The probe will journey to the Red Planet to study the climate and the reasons behind the deterioration of the Martian atmosphere. The data will then be shared with the global space and scientific communities. The UAE has prioritised the space sector as being one of the key components of its drive towards a sustainable post-oil economy. In June 2016 NASA and the UAE Space Agency formalized cooperation in the exploration of Mars as the first field of collaboration between the agencies by signing an Implementing Arrangement under the Framework. The Implementing Arrangement establishes a joint steering group to guide discussions about potential future projects that contribute to exploring the Red Planet.